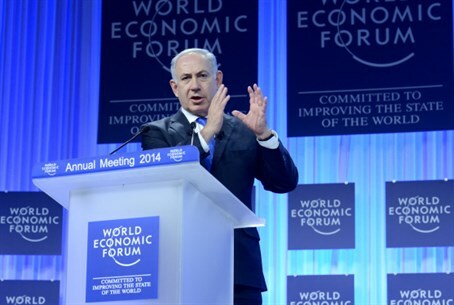 Prime Minister Netanyahu tells reporters in Davos that he will not evict any Israeli communities in the Jordan Valley. Prime Minister Binyamin Netanyahu made it clear on Friday that he will not evict any Israeli communities in the Jordan Valley as part of a future agreement with the Palestinian Authority (PA). "I have said it before and I repeat it today: I'm not going to evict a single community, I am not going to uproot any Israeli from his home,” Netanyahu said at a press conference following his meeting with U.S. Secretary of State John Kerry on the sidelines of the World Economic Forum in Davos. He added that a peace agreement is not on the table at the moment and that even a framework agreement is not being discussed. "The Americans are talking about a suggestion for a framework for negotiations. This is not an agreement, but a path to making progress,” said Netanyahu, according to NRG/Maariv, adding that his meeting with Kerry had been very good. In Friday’s press conference, Netanyahu also rejected Iranian President Hassan Rouhani’s claim that his country is not seeking a nuclear bomb. Netanyahu noted that said Iran was engaged in a “campaign of fraud” to mislead the world about its aspirations and dismissed Rouhani’s speech at Davos on Thursday. “He said they have no intention to develop nuclear weapons. Come on. Does anybody really believe that? Does anybody really think that? They’re investing these tens of billions. By our estimation, they have invested $160-170 billion dollars. What for? To develop isotopes to despatch on ballistic missiles to sick Iranians around the world? Of course they intend to develop nuclear weapons,” he said.